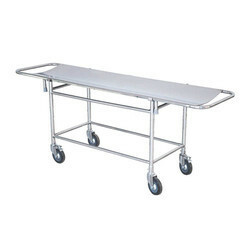 Prominent & Leading Manufacturer from Hyderabad, we offer stretcher on trolley. Both Side folding stainless top fixed on CR tube frame. Base frame: 50 x 25 mm CRCA tube. Mounted on 150mm dia heavy duty castors. Looking for Stretcher on Trolley ?